The Spring 2019 Issue is now available! The Digital Edition includes the full version of the magazine plus extras you can’t find anywhere else. You will have access to original EV Video Tours shot on location by our photographers, stunning 360-degree views, and useful tools like real-time weather updates and currency exchange rates. Just select the member type and device to get started. 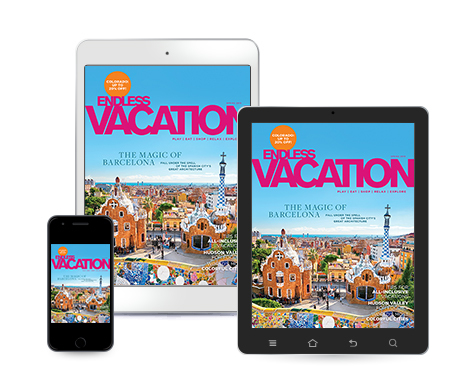 You can download the Endless Vacation® magazine app for iPhones and iPads from the App StoreSM. Click here if you’re in the United States, or if you are outside the US, access the App Store on your device and type “Endless Vacation” in the search field. Select “Get” to begin downloading. When the app is done downloading, tap the icon to launch the app. You can start viewing content from the current issue once you open the app. You can use the menu button found at the top left of the home screen to access web stories and older issues. Articles marked “RCI Login Required” require you to sign in to your RCI account. Simply select the article and you will be prompted to login from the login screen. Enter your RCI.com username and password. Select “Weeks” or “Points” depending on your membership type. You will then be able to access all RCI® subscribing member articles in the current issue. You can download the Endless Vacation magazine app using the Google PlayTM store app. Click here if you’re in the United States, or if you are outside the US, access the Google Play store app on your smartphone or tablet and type “Endless Vacation” in the search field. Select “Install” to begin downloading. The app should download to your home screen. If not, you can find it on your Apps page. Tap to launch the app. You can start viewing content from the current issue once you open the app. You can use the menu button found at the top left of the home screen to access web stories and older issues. Articles marked “RCI Login Required” will require you to sign in to your RCI account. Simply select the article and you will be prompted to login from the login screen. You will then be able to access all RCI subscribing member articles in the current issue. If you are a Weeks Member or Points Member, click here. Choose the issue you would like to view and click on “View”. A new window will open up the issue you selected. Then click “Endless Vacation magazine Digital Edition” under the “Vacation Ideas” tab. Choose the issue you would like to view and click on “View”. A new window will open up the issue you selected. Then begin reading. You can download the Endless Vacation magazine app for iPhones and iPads from the App StoreSM. Click here if you’re in the United States, or if you are outside the US, access the App Store on your device and type “Endless Vacation” in the search field. Select “Get” to begin downloading. You can start viewing content from the current issue once you open the app. You can use the menu button found at the top left of the home screen to get access to web stories and older issues. To view the latest issue of Endless Vacation magazine on your desktop or laptop, click here. *Endless Vacation magazine is an independent publication and has not been authorized, sponsored, or otherwise approved by Apple Inc. Apple, the Apple logo, iPhone and iPad are registered trademarks of Apple Inc., registered in the U.S. and other countries. App Store is a service mark of Apple Inc.
**Android and Google Play are trademarks of Google LLC.